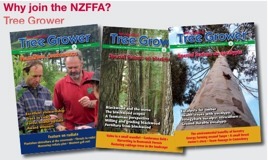 Geoff Thompson, New Zealand Tree Grower August 2018. Forestry is in the spotlight now but for a long time was an industry taken for granted and largely banished from bureaucratic interest. During that time there was a grumbling about the money allocated to forest research through Scion and a call went up for forestry to pull more of its own weight. After some years of consultation, a proposal to raise funds from a levy on harvested wood was agreed. 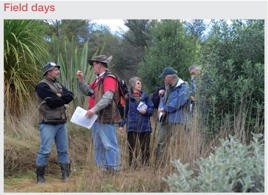 An establishment committee was formed with representatives of the NZFFA and the NZ Forest Owners Association.This group put together a programme to use the funds raised and undertake a referendum on the proposal. A voting and representation system based on the division of the plantation forest industry between the large corporate and small-scale growers was put in place. The referendum in 2013 was successful with an 84 per cent ‘Yes’ vote based on volume and numbers. The Forest Growers Levy Trust has been in operation for over five years and is now planning to renew its mandate – a requirement for a commodity levy is a vote every six years.We expect to hold the new referendum early in 2019, but information material will flow from this month. From the very start, the board of the Forest Growers Levy Trust stuck closely to the spending guidelines included in the referendum. This practice will continue for the future but with some modifications as the industry changes. The board operates under a prime imperative − is the expenditure of benefit to the entire industry including large and small-scale foresters? We expect this to continue and are happy to hear ideas for improvement within these guidelines. With over five years of experience we think the project has been a success. For the initial referendum an annual budgeted income was $6.55 million but it rose quickly above this and for the 2017 calendar year the income was $9.16 million. The levy is based on the volume of wood harvested not its value and we are expecting a rise to $11 million this year. With the harvesting of 1990s planting coming on stream we see funds increasing to a distributable fund of around $10 million a year as realistic. The constraint on the forest funds, like much of plantation forestry, will be how much labour will be available to undertake the harvest and initiatives are being supported to address this problem. The funds available are allocated along lines approved within the initial referendum. Combined committees of the NZFOA and NZFFA recommend programmes and monitor the performance approved by the board. The large sum allocated to biosecurity is notable at a time when risks to plant and animal health are in the headlines. The Forest Growers Levy Trust funds a detailed survey of every plantation, large and small. The response to the dreadful record of forest fatalities a few years ago has helped reduce the numbers killed or seriously injured. The levy funds support work of the Forest Industry Safety Council and this will continue. Research and development to improve wood quality, production and value is the principle expenditure benefitting all forestry large and small scale. The secretariat works closely with Scion and other research facilities on a continuing basis and is able to make long-term commitments on research projects. Included is the support for greater mechanisation of forestry from nurseries to steep land harvesting. This meets a number of needs from replacing the hands-on chainsaws to reducing the risk of accidents and fatalities. Funding has been increased for training and university study courses and there is close monitoring of this area to improve recruitment into the industry. Promotion of the industry is also supported along with maintaining the social licence to operate along with the environment committee as it completed the National Environmental Standards for Plantation Forestry. There are other committees working for industry good and a recent addition has been the Small and Medium Enterprise Committee mainly consisting of NZFFA personnel. The work benefits all growers and input is welcome from constituents − current or future levy payers − particularly at this point when the design of the future board and programme are being considered for the new referendum. This will not be left to chance and it is proposed to have a professionally conducted survey carried out before the referendum to test the current thinking on the work of the proposals for the future, especially any improvements which can be incorporated as well as general views. Momentum will build up from this month and direct mail, relevant media and television will be used to explain what is going on to promote participation in the referendum. It is a busy time ahead and the forest industry is happy to be a major centre of attention and making an increased contribution to a growing economy. Geoff Thompson is the Chair of the Forest Growers Levy Trust Board.